Out of sight of most Americans, global corporations like Nestlé, Suez, and Veolia are rapidly buying up our local water sources—lakes, streams, and springs—and taking control of public water services. In their drive to privatize and commodify water, they have manipulated and bought politicians, clinched backroom deals, and subverted the democratic process by trying to deny citizens a voice in fundamental decisions about their most essential public resource. The authors' PBS documentary Thirst showed how communities around the world are resisting the privatization and commodification of water. 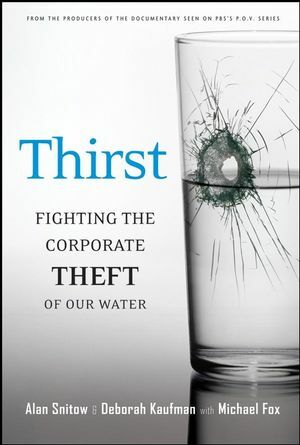 Thirst, the book, picks up where the documentary left off, revealing the emergence of controversial new water wars in the United States and showing how communities here are fighting this battle, often against companies headquartered overseas. Alan Snitow is an award-winning documentary filmmaker and journalist. Kaufman and Snitow's films include Thirst, Secrets of Silicon Valley, and Blacks and Jews. Deborah Kaufman is a film producer, director, and writer. Michael Fox is a film critic, journalist, and teacher. 1. Water: Commodity or Human Right? Battles for Water in the West. 2. Hardball vs. the High Road. 3. Small-Town Surprise for a Corporate Water Giant. 4. The Price of Incompetence. 6. Keeping the Companies at Bay. Corporate Target: The Great Lakes. 9. To Quench a Thirst. 10. Whose Water, Whose World Is It? Is water a human right or a commodity to be marketed for profit? Should water be run by local governments or by distant corporations? Why do we pay more for bottled water than for gasoline? These are some of the tough-minded questions Alan Snitow and Deborah Kaufman first asked in their provocative and memorable 2004 documentary, also titled "Thirst." In their new book, the authors investigate how the growing "water business" is trying to privatize water systems in cities scattered across the United States. More often than not, local citizens don't even know their water is being sold. But when people do know what's happening, they form powerful coalitions, fueled by indignation and outrage. In the process, citizens rediscover some of the basic principles of democracy, namely, that they should have a voice in their government. This is the cautionary tale the authors tell through their vivid descriptions of eight conflicts over water -- from Stockton to Atlanta, Ga.
"The current conflict between corporations and citizens movements to control this precious resource," they write, "will be decided in the years to come. The outcome of the conflict will surely be a measure of our democracy in the 21st Century." Thirst the Movie Learn more about the book that is based on the ground-breaking documentary film. View excerpts and reviews, order the film, and find resources on how to fight the corporate theft of water.